No member of the public appeared before them during the Sept. 12 public hearings, and no one offered any last-minute amendment. Therefore, the Sarasota County commissioners literally followed a script provided by staff as they worked toward unanimous votes that evening, approving the proposed millage rates and tentative budget for the 2019 fiscal year on the first reading. As County Administrator Jonathan Lewis pointed out, the countywide millage rate will remain unchanged from this fiscal year: 3.3912 mills. The last increase was in 2013, he noted, and that was because of the necessity of an adjustment of the millage rate for the Mosquito Control District. The July 1 estimate of the taxable value of county property, provided by the Sarasota County Property Appraiser’s Office, is $58.6 million. The total tentative budget for the new fiscal year, which will begin on Oct. 1, is $1,242,441.007. That represents an increase of 9.8% year-over-year. 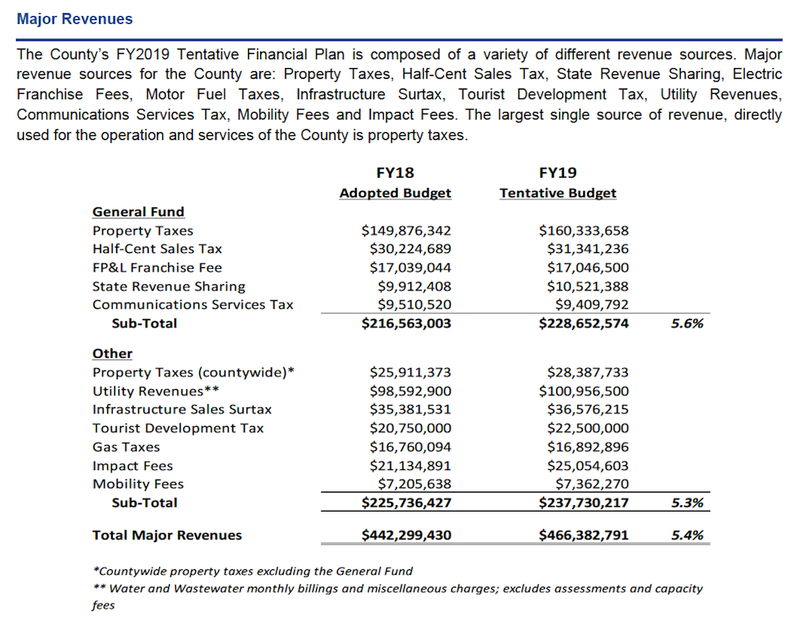 The portion of the budget set aside for the county’s Capital Improvement Program in FY19 is $351 million. Of that amount, $271,586,115 has been allocated to projects. Debt service on bonds will account for $79,815,433. 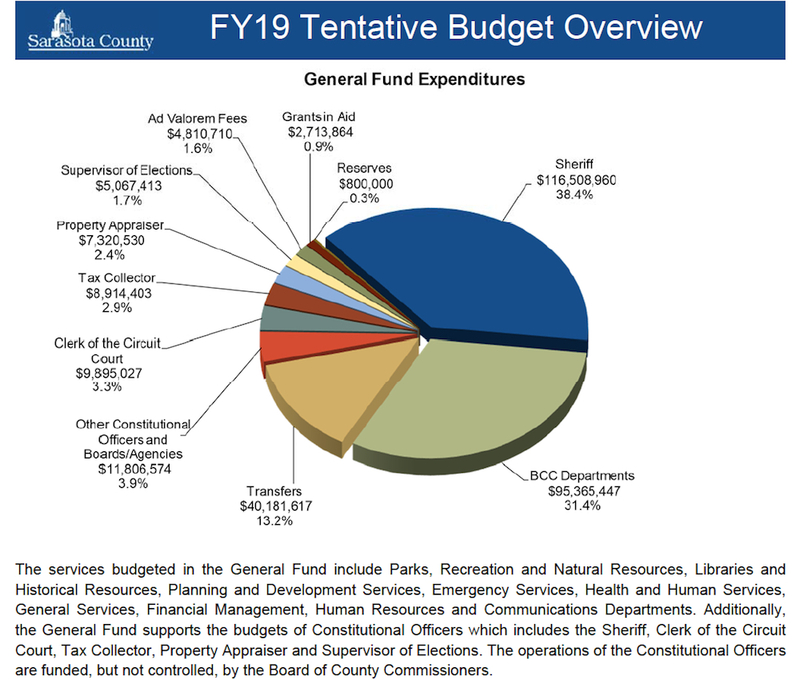 The General Fund, which covers the operating expenses for services that are countywide in nature — as a board document noted — totaled $303,384,545 as of Sept. 12. Property tax revenue is expected to account for $160,333,658, or 52.8%, of that amount. Permits, fees and special assessments make up 5.9% of the tentative General Fund: $17,883,186. The final public hearing on the tentative budget will be held at 5:30 p.m. on Thursday, Sept. 27, at the R.L. Anderson Administration Center, located at 4000 S. Tamiami Trail in Venice. County Administrator Lewis joked on Sept. 12 that the board had had at least one budget workshop or discussion every month since December 2017, except for February.